Escape the urban bustle at Cupsogue Beach County Park and Sam's Point Preserve. 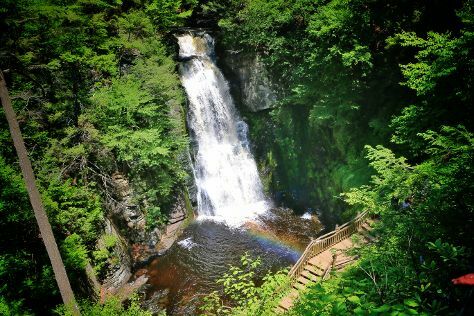 You'll explore the less-touristy side of things at Bushkill Falls and Cornelia & Florence Bridge Nature Preserve. Change things up with these side-trips from New York City: Belmont Lake State Park (in North Babylon), Stokes State Forest (in Branchville) and Ice Caves and Verkeerderkill Falls Trail Hike (in Cragsmoor). There's lots more to do: contemplate the waterfront views at Upper Delaware River, go for a walk through Central Park, identify plant and animal life at Black Creek Preserve, and kick back and relax at 8th Ave Jetty. To find more things to do, other places to visit, photos, and other tourist information, read our New York City trip itinerary tool . If you are flying in from Ukraine, the closest major airports are La Guardia Airport, Newark Liberty International Airport and John F Kennedy International Airport. In June, plan for daily highs up to 31°C, and evening lows to 21°C. Wrap up your sightseeing on the 11th (Tue) to allow time to travel back home.